Last year, we moved Impetuous to Pensacola, Florida for various reasons. Mainly, because the Admiral said the boat wasn't going back to Texas. Well, the Texas registration just ran out and we decided to go ahead and register the boat with Florida. Here's the thing. According to Florida, she's an antique. 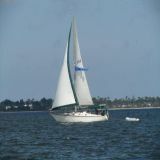 The boat is 30+ years old, she is used for recreation and she has the original engine installed. (You have to have the same year and type of engine.) In Florida, your boat registration runs out on your birthday. The nice lady at the tax office asked if I wanted to go to next year and I said yes. So 18 months of registration. OK, how much? $8.50 Yep, $8.50USD for 18 months in Florida. Texas wants $132 for 2 years. I guess I really need to stay up with the maintenance on the Beast. Don't know where I'm going to find another 1980 W50 that runs. Great Post, wish they did the same in New York. We have Historical car Registrations, not sure how much they cost. Our Boat Reg is $93.73 here.